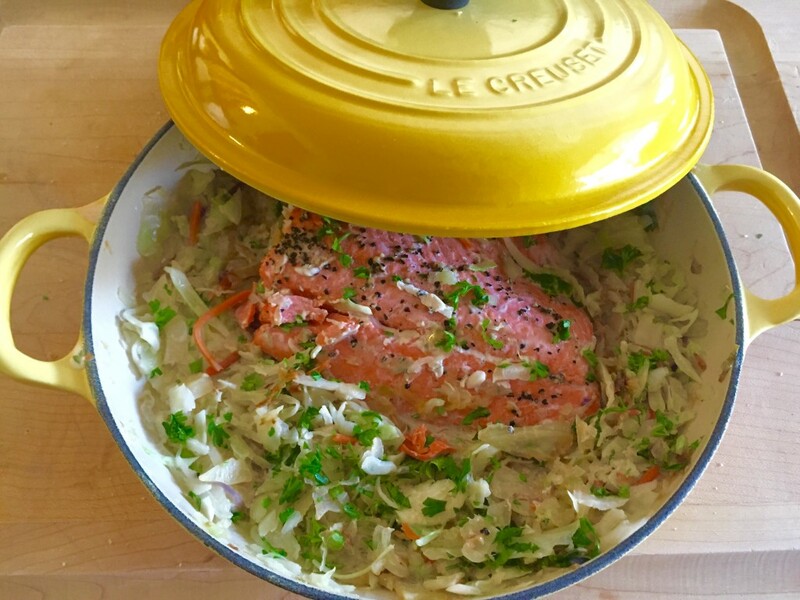 Here’s a review of the 1 1/2-quart Le Creuset braiser….but first, a little story about how I came to own (and love) a pan I thought I’d have no interest in whatsoever! Question: How many art directors does it take to screw in a light bulb. Answer: Does it have to be a light bulb? Anyone who has ever worked in a photo studio with an art director will totally get that joke. You see, we editors and writers are somewhat literal minded. If we have, for instance, a fabulous espresso machine we’re reviewing for a story, it makes most sense (to us, anyway) to show a shot of the espresso machine. The art director, however, will want to show an artsy shot of the steam coming out of the machine. Hence, the question: “Does it have to show the espresso machine? Can we just show a really cool shot of steam coming out of it?” Does it have to be a light bulb? It’s a constant battle–and these visual days, the art director usually wins. The Le Creuset 1 1/2-quart braiser. I’m using it much more often than I thought I would. 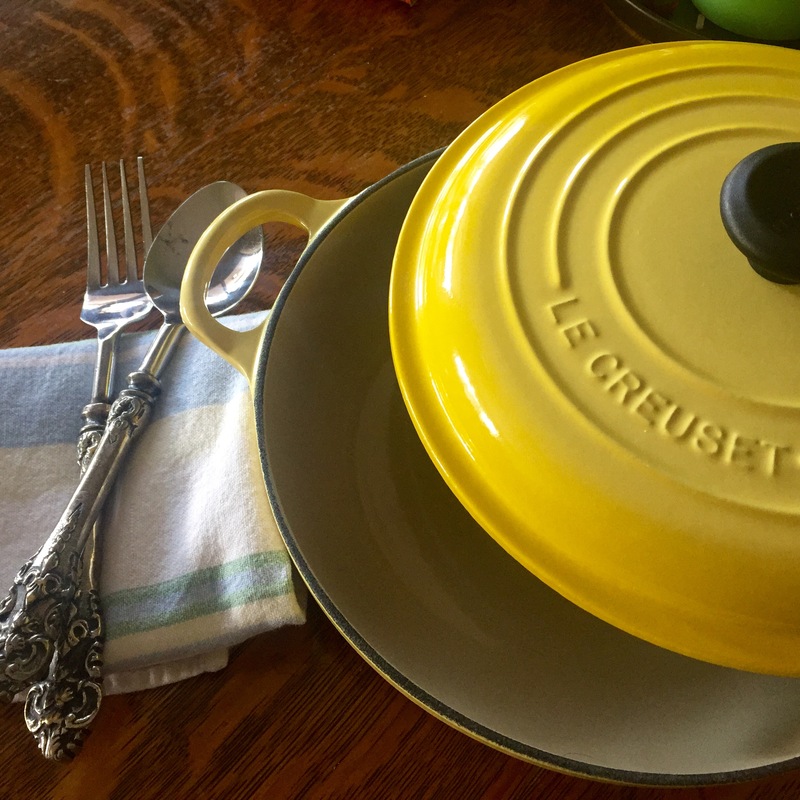 As was the case recently, when I was writing an article on one of my favorite topics, the Le Creuset Braiser, for dsm Magazine, a luxury lifestyle magazine in Des Moines. I of course, wrote about my favorite size, the 3 1/2-quart braiser, and recommended we show a photo of that size. Alas, it seems she had fallen in love with the 1 1/2-quart braiser. Indeed, it’s very photogenic and really, really cute. But could I recommend it? I was skeptical. For me, the pleasures of braising is that you braise those big, inexpensive and ungainly, Fred-Flinstone-esque cuts of meat: chuck roasts, short ribs, pork shoulder, country-style pork ribs and the like. Even if you’re not for a cooking for a crowd, you have this fabulous thing called leftovers! What on Earth, then, would I do with a 1 1/2-quart braiser? It’s not big enough for a 7-bone pot roast (my favorite cut of beef, by the way. Here’s a recipe) or other cuts I love. Sure, you could probably braise a small bread-and-butter pot roast, or four chicken thighs in it….but why would you cut down a recipe to serve two when you could make the whole batch and have leftovers? Because I would never recommend something I wasn’t 100% confident about, I asked the Le Creuset PR folks to send me a 1 1/2-quart braiser for testing. The graciously obliged. And, as it turns out, this cute-as-a-bug pan has become the second-most used pan in my kitchen (after the 3 1/2-quart braiser). Capsule Review: The 1 1/2-quart Le Creuset Braiser offers everything you love about the 3 1/2-quart Le Creuset Braiser: The tight-fitting lid that seals in the moist heat for the best braised dishes, the wide base, the cast-iron durability, and those marvelous colors. It’s just smaller, that’s all! And you’ll use it more often than you’d have ever thought. At least I do. 1. Use the Le Creuset 1 1/2-quart braiser for braising recipes for two. Salmon on a bed of creamy cabbage. Prime example of a recipe for two in this cute little braiser. As I mentioned, it’s rare that I braise a dish that serves less than four, but every once in a while, I do braise a two-serving recipe. I did this just the other day with my Salmon on a Bed of Creamy Cabbage, a recipe I’ll post in the next few days. If you enjoy braising for two, this is definitely your pan. While recipes in my braiser cookbook generally serve four, you can easily cut the recipes in half to serve two. The timings will be the same. Same goes for any of the braising recipes on this site. 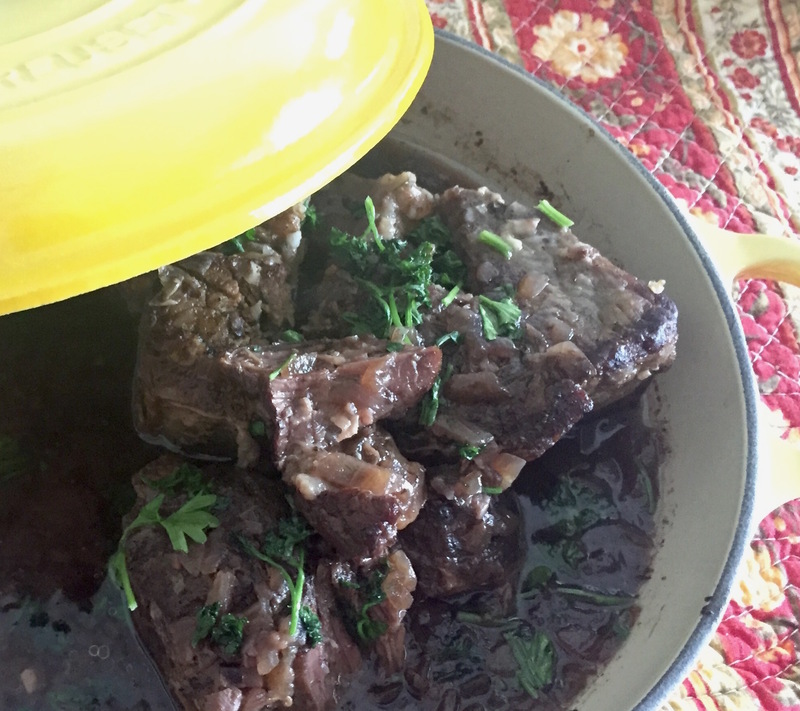 (Here’s a link to lots of braising recipes, by the way). 2. Use the Le Creuset 1 1/2-quart braiser for roasting potatoes, Brussels sprouts, and other side dishes. Keep the lid off, and you can easily use the Le Creuset 1 1/2-quart braiser to roast potatoes and other roast-able vegetables in the oven. 3. Use the Le Creuset 1 1/2-quart braiser for parboiling, steaming and sautéing vegetables. 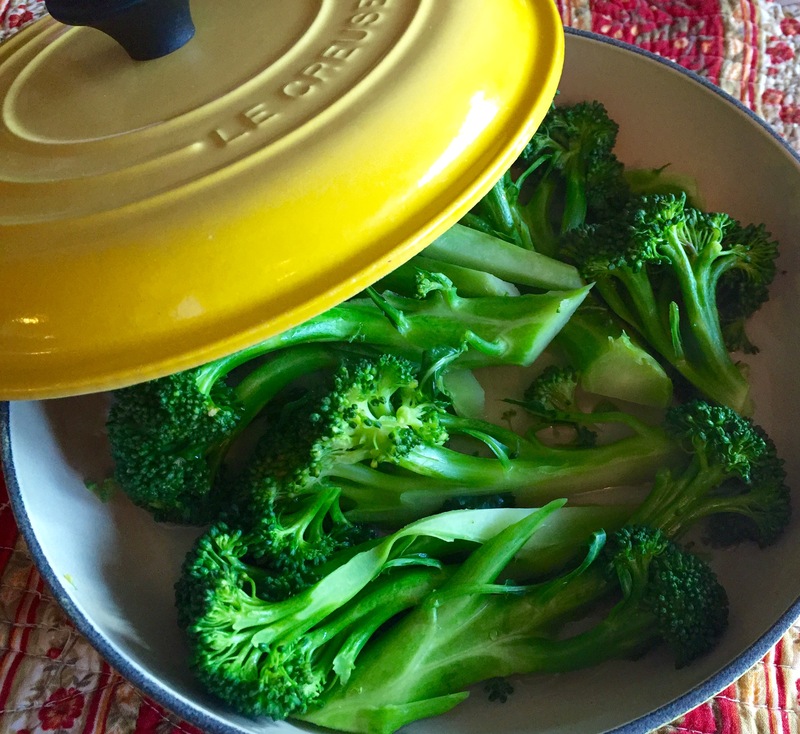 The Le Creuset 1 1/2-quart braiser is the perfect size for cooking four servings of steamed broccoli. The wide, shallow base lets you put a little bit of water (about 1/2-inch) and about 4 servings of veggies in the braiser. The tight-fitting lid keeps the steam inside. And if you cook Green Beans like I do (that is, you steam them first, drain and then sauté in butter), the wide, shallow base makes this pan is the perfect pan for this. And, of course, this pan works great for other veggies that you simply want to sautée, including zucchini, yellow squash, spinach, asparagus, etc. However, if you’re making more than 2 to 3 servings, a skillet will be roomier for all the movement needed in a sautee. Love the Le Creuset 1 1/2-quart braiser for reheating leftovers for two. That’s My French Potroast. This little guy comes in incredibly handy when I’m reheating two servings of leftovers. It’s much, much handier, in fact, than the 3 1/2-quart braiser for this task, as the larger braiser is way too big for smaller amounts—the pan sauces, gravies, and cooking liquids dry up in a flash. Let me be clear about one thing: If you’re trying to decided between the 1 1/2-quart and the 3 1/2-quart braiser, I’d definitely buy the 3 1/2-quart braiser first. But I’m really, really glad that I now own the 1 1/2-quart braiser, too. Any questions? Ask away! I’ve tested the heck out of this thing, and would be happy to offer further insights. You have to post that Salmon/Creamy Cabbage recipe ASAP, SVP! That I want one of these is a given. The bigger question is: What color! 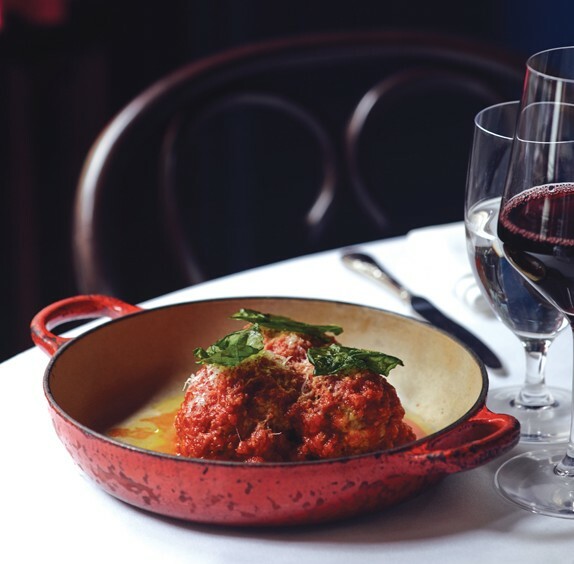 ‹ What Size of Braiser Should I Buy?